Lilianfels Resort and Spa, Blue Mountains is a renowned haven of relaxation in one of Australia's most beautiful destinations. 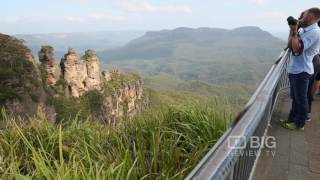 It sits adjacent to The Three Sisters, one of the countries most acclaimed natural wonders and surrounded by the world heritage listed Blue Mountains National Park. . The hotel is housed in a historic country mansion set amidst two acres of manicured gardens, overlooking some of the most spectacular scenery in the Blue Mountains, in New South Wales. Just a short drive from Sydney, the hotel is a breathtaking escape for romantics, a delight for gourmets and a wonder for lovers of nature. Lilianfels health spa offers a restorative, relaxing, healthy environment, providing all the benefits of an enriching regime and a complete experience for mind and body.